It's been a rocky start for 2010 for my Poker playing. 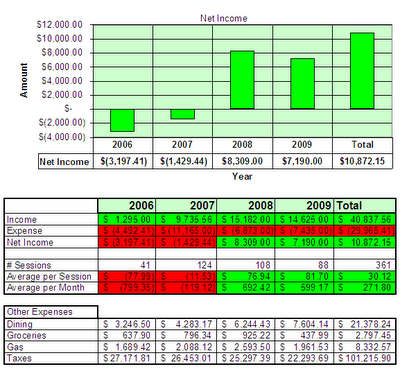 2009 was a pretty good year all the way thru until November when I had my first losing month in over a year. I managed 3 losses and 2 winning sessions. I dont think I played badly, just ran into to many gamblers and bad luck. I have always said that my game really requires that I not run into any bad luck. This month was to much of that. Generally, I was always ahead and they just sucked out on me. During my last session of the year I was getting more lucky then normal. My rags were hitting! Open enders with 89 and 64, hitting 2 pair with 53, etc.. I usually dont like to play those hands, but I kept noticing that when I folded them, they kept hitting. I noticed 3 times on the button that my rags were hitting 2-pair every time. I usually dont play the button with that crap, but decided why the heck not. Sometimes when you are hot, you just have to playing any 2 hands. Just be careful, it doesnt last for ever and never become cocky. This game has a tendacy to make you humble when you least suspect it. The last session of the year I booked a $300 win. I'll take it and hopefully the rest of the year is more steady. Below is a summary chart for my poker stats for the past 4 years. Actually, started playing 3.25 years ago. I loss allot of money for the first 6 months and its been a nice steady rise since then. I have constantly made money at poker for the last 2.5 years. I have also included my four largest expenses for the year. Unfortunately, my biggest expense is taxes! The lesson here is to learn to minimize your taxes, it is usually your biggest expense.